China and Japan's dispute over the Japanese purchase of the Diaoyu Islands has started massive protests, shut down factories, and has threatened $340 billion in annual trade. 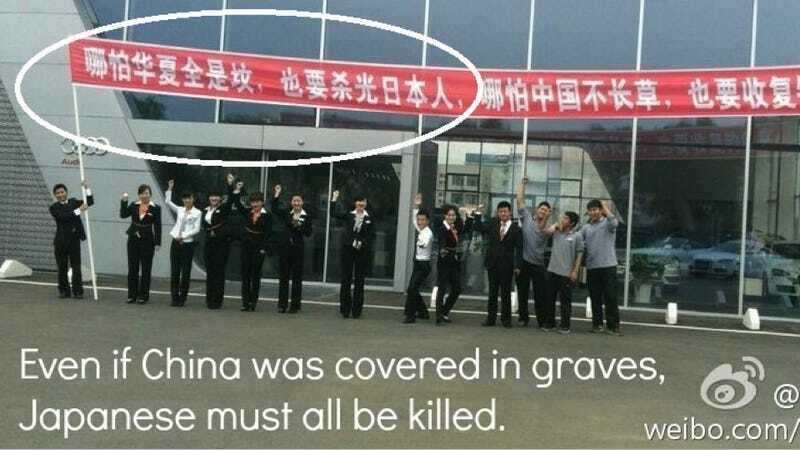 A photo even purportedly showed an Audi dealer wishing all Japanese were dead. And now, like any good scandal, Taiwanese animators are breaking it down for us, but they still have one pretty good question: "What the hell, Audi?" The animation, which is done with the typical Taiwanese flair, shows just how the dispute started. It does take a bit of a comical slant on the situation which isn't really funny at all. Basically, it's your typical Taiwanese news animation. "Even if graves cover our land, all Japanese must be killed. Even if our soil is not fit for growing crops anymore, we must get back the Diaoyu (fishing) Islands"
We have reached out to Audi to find out if it's real and they are trying to ascertain what exactly is happening in the photograph, but the reality isn't that important. The image is being passed around in China as if it's real and there are people who appear to agree with the sentiment. It's not likely this will actually result in global war, but there are billions of dollars at stake in this dispute, as well as the economy of two nations that have hefty trade agreements with each other. These might be dealer employees, but they are definitely not Audi China or FAW VW [VW's manufacturing co-venture in China] employees. Audi categorically distances itself from the message shown here. It is not the place of the Audi brand to enter political matters. Audi also told us they weren't sure if sanctions would be placed against the dealer involved in the future.